This is the correct version of the article published in User Experience Magazine: Volume 8, Issue 1, 2009. The version in the print magazine is the incorrect version; it is an early draft that was not ready for publication. In the next few decades we will see unparalleled growth in the number of people becoming elderly. As we age, we experience increasing impairments that affect how we interact with computers and websites. A Web Accessibility Initiative (WAI) project seeks to understand the user experiences of older people with age-related impairments, and how they overlap with the user experiences of people with disabilities. The Web Accessibility Initiative: Ageing Education and Harmonisation (WAI-AGE) Project aims to promote education and harmonization on the accessibility needs of older users and guidelines for developing websites for older users. It includes an extensive literature review to learn user requirements, and educational resources for web user experience professionals, designers, developers, and project managers, as well as for older users. WAI-AGE has identified that the existing WAI accessibility guidelines address the majority of requirements of older people for Web use. It also identified that many older people are not using adaptive strategies to help accommodate their impairments, and that web designers and researchers are not considering the WAI guidelines when making recommendations about website design for older people. WAI will be producing new and updated educational materials to address these gaps. The WAI-AGE project materials are intended to help web developers and researchers better understand how existing WAI accessibility guidelines/standards address the needs of older users, and how they can build on the existing guidelines further as the needs of older users are better understood. Additionally, the project is intended to help researchers target areas that still need investigation with respect to Web use by older people. This article explains age-related impairments that impact Web use, requirements for web design that enhance the ability of older people to use the Web, how existing accessibility guidelines for people with disabilities cover the needs of older users, and future work in this area. Age matters with wine and cheese, and also with the user experience of older people on the Web. As we age, we experience increasing impairments that impact how we interact with computers and websites. This article provides a peek into these issues, and points to existing solutions for making websites accessibility to older users, along with users with disabilities. The Web Accessibility Initiative: Ageing Education and Harmonisation (WAI-AGE) Project aims to promote education and harmonization on the accessibility needs of older users. It includes an extensive literature review to learn about their requirements, and educational resources for web user experience designers, developers, project managers, and older users. WAI-AGE is a European Commission-funded project of the World Wide Web Consortium (W3C) Web Accessibility Initiative (WAI). W3C is the international standards making body for the Web. WAI, a group within W3C, works with organizations around the world to develop strategies, guidelines, and resources to help make the Web accessible to people with disabilities. The next few decades will see an unparalleled growth in the number of people becoming elderly compared with any other period in human history. The United Nations estimates that by 2050 one out of every five people will be over 60 years of age, and in some countries the proportion will be much higher than this. In the near future it is estimated that the European Union will experience a demographic shift from 2000 when 15.7% of the population was over 64, to an estimated older population of 17.6% in 2010 and 20.7% by 2020. In Japan the change is even more dramatic with 20% of the population already over 65 in 2005, and forecast to increase to 27% by 2015. With increasing age, we often have increasing visual, auditory, physical, and cognitive impairments. The Royal National Institute for the Blind (RNIB) in the UK estimates the proportions of older people in the UK affected by eyesight decline that significantly affects daily living, as: 15,8% of people 65 to 74 years, 18.7% of people 75 to 84 years, and 45.8% of people over 85 years. All of this impacts the ability to view a web page, perceive the information displayed, and notice small changes such as minor updates on web pages. Hearing loss is also common as we age. Estimated percentages of the older UK population who experience moderate to profound deafness are: 18.8% of people 61 to 80 years and 74.7% of people over 81 years. There is an increasing amount of audio and video on the Web, especially on news sites, entertainment sites, and social networking sites. Hearing loss significantly affects an older person’s access to this type of material if alternatives are not provided. Arthritis, which affects 50% of Americans and Australians over 65, and Parkinson's Disease, are the primary physical debilitators of older people. Both arthritis and Parkinson's are likely to cause difficulties using a mouse and other pointing devices. There are many different types of cognitive deficits. Among older people, dementia, including Alzheimer's Disease, appears to be the most common. Prevalence rates of dementia with age are estimated at 1.4% for people between 65-69 years, rising to 23.6% for people over 85 years. These factors likely affect how people use websites. For example, it may be difficult for people experiencing MCI to understand the navigation design of websites, or to remember specifics about how to operate different user interfaces. One of the issues with age-related functional impairment is that older people are likely to develop multiple impairments. Twenty percent of Americans over 70 years reported dual sensory impairment. High levels of dual impairment increase a person's difficulty with the "instrumental activities of daily living". In Australia, over half the population aged 60 years and over has an identifiable disability. However, because age-related impairments usually develop slowly, they are often not recognized as disabilities. Furthermore, many older people do not want to acknowledge the ageing process, and deny or disguise any functional or sensory impairment. 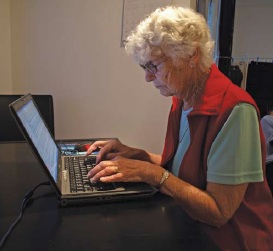 There is a false perception that older people are not online. This is a myth, as older people are the fastest growing demographic online. In the UK, recent surveys indicate that 30% of all those over 65 years have used the Internet, up from 18% in 2006. With more reasons to be online, from communication to governmental services to shopping, banking and travel, we expect this proportion to continue growing. After reviewing this wide range of literature that considered age-related functional impairments and issues facing older Web users, we are able to make some observations about the experience and requirements of older users. Many aspects of good usability for all were included in the recommendations in the literature; that is, the recommendations do not apply exclusively to older users, but are general usability principles for all users. Web inexperience is currently an influencing factor in many studies and received a lot of discussion. The combination of inexperience and functional impairments can be overwhelming for some users. Inexperience will be significantly diminished as a major factor over time as additional older people gain access to the Web, and hence build experience. Additionally, many of the "younger older" users have been using the Web previously. However, new web applications and uses may create a new form of inexperience as the Web continues to evolve. While the body of literature reviewed is largely comprehensive, we did identify some gaps. Hearing loss and deafness were clearly identified as a common sensory loss associated with ageing. However, most of the literature did not include recommendations for meeting the needs of users with hearing loss; and research on older users' web experience did not cover hearing issues. Existing Web accessibility guidelines/standards for people with disabilities were not acknowledged or discussed in most of the recommendations for designing web pages to meet the needs of older users, nor were they discussed in much of the scientific literature. In of the absence of this knowledge/acknowledgment of existing guidelines, many authors "reinvented the wheel" and developed redundant recommendations. Our comparative analysis showed that the almost all of the presentation and navigation related needs identified in the literature such as contrast, text size, line spacing, and link identification were covered within WCAG 2.0, along with the identified technical requirements such as the use of CSS. Some of the other needs, such as simplified interfaces, could be met by browser modifications. WAI guidelines actually cover a broader range of age-related impairments and their impact on Web use than the literature identified. Specifically WAI includes the needs of people with hearing difficulties, and also requires that websites be usable with only a keyboard, which benefits users with arthritis and limited fine motor control. While most of the literature focused on what web designers need to do to make their websites usable by older users, WAI guidelines take a broader approach to making the Web accessible for all. For example, the functionality provided by browsers, such as the ability to increase font size, impacts how older people interact with the Web, and also what website designers need to do in their sites. WAI's UAAG defines what browsers need to do to support accessibility. Authoring tools (web page editors, content management systems (CMS), blogging software, etc.) also play an important role in accessibility, particularly for older users who are creating or contributing to websites themselves. WAI's ATAG defines how authoring tools should help web developers produce accessible websites, and also defines how to make the tools themselves accessible so that people with disabilities and older users can use the tools to create websites. We hope that the results of this project, including the literature review itself, will help researchers target areas that still need investigation with respect to web use by older people, such as hearing decline and cognitive issues. We also hope that the project will help researchers and practitioners gain a more comprehensive understanding of how existing WAI accessibility standards/guidelines address the needs of older users, and how they can build on them further as the needs of older users are better understood. The WAI-AGE project's literature review identified significant overlap between the accessibility needs of older users and the accessibility needs of users with disabilities. Our analysis determined that the existing international standard Web Content Accessibility Guidelines (WCAG) 2.0 covers nearly all of the requirements of older web users. However, people are spending effort developing redundant recommendations/guidelines. The WAI-AGE project aims to help connect researchers and practitioners across different areas and to share knowledge that will encourage further development and support of existing web accessibility standards. The project also aims to bring the ageing and disability communities together to promote and support these standards. The literature review shows a need for more research and investigation in specific areas of web access by older people, including age-related hearing loss, cognitive impairments, navigation styles and preferences, and the use of adaptive strategies for web browsing. The WAI-AGE project welcomes participation by experts, trainers, researchers, and users who are interested in developing and promoting accessible web solutions. "Web Accessibility for Older Users: A Literature Review" is introduced at www.w3.org/WAI/intro/wai-age-literature. Citations for the statistics in this article are in the literature review at www.w3.org/TR/wai-age-literature/. Andrew Arch, Ph.D., is a Web Accessibility and Ageing Specialist on WAI-AGE, a project to increase the accessibility of the Web for people with age-related accessibility needs. The Web Accessibility Initiative: Ageing Education and Harmonisation (WAI-AGE) project is a European Commission-funded project of the World Wide Web Consortium (W3C) Web Accessibility Initiative (WAI). Andrew has been actively involved with W3C WAI Education and Outreach Working Group (EOWG) for 8 years. Prior to joining W3C, Andrew worked at Vision Australia for seven years, leading a team that provided consulting, reviewing and training services around Web accessibility. Shadi Abou-Zahra coordinates WAI outreach in Europe, and accessibility evaluation techniques. He is the Activity Lead of the WAI International Program Office, which includes groups that are responsible for education and outreach, coordination with research, general discussion on Web accessibility, coordination with the WAI Technical Activity, and WAI liaisons with other organizations including standards organizations and disability groups. Shadi chairs the W3C Evaluation and Repair Tools Working Group (ERT WG), is a staff person of the WAI Ageing Education and Harmonisation (WAI-AGE) project, and participates in the W3C Education and Outreach Working Group (EOWG). Shawn Lawton Henry leads worldwide education and outreach promoting accessibility for people with disabilities at the W3C Web Accessibility Initiative (WAI). Shawn focuses her personal passion for accessibility on bringing together the needs of individuals and the goals of organizations in designing human-computer interfaces. Her latest accessibility book Just Ask: Integrating Accessibility Throughout Design offers an approach for developing products that are more usable for everyone. Authors: Andrew Arch, Shadi Abou-Zahra, and Shawn Lawton Henry. Developed under the WAI-AGE Project. [Contacting WAI] Feedback welcome to wai-eo-editors@w3.org (a publicly archived list). Copyright © 1994-2009 W3C® (MIT, ERCIM, Keio), All Rights Reserved. W3C liability, trademark, document use and software licensing rules apply. Your interactions with this site are in accordance with our public and Member privacy statements.